ANGUS WHITEHEAD (richard.whitehead@nie.edu.sg) is assistant professor of English literature at the National Institute of Education, Nanyang Technological University, Singapore. 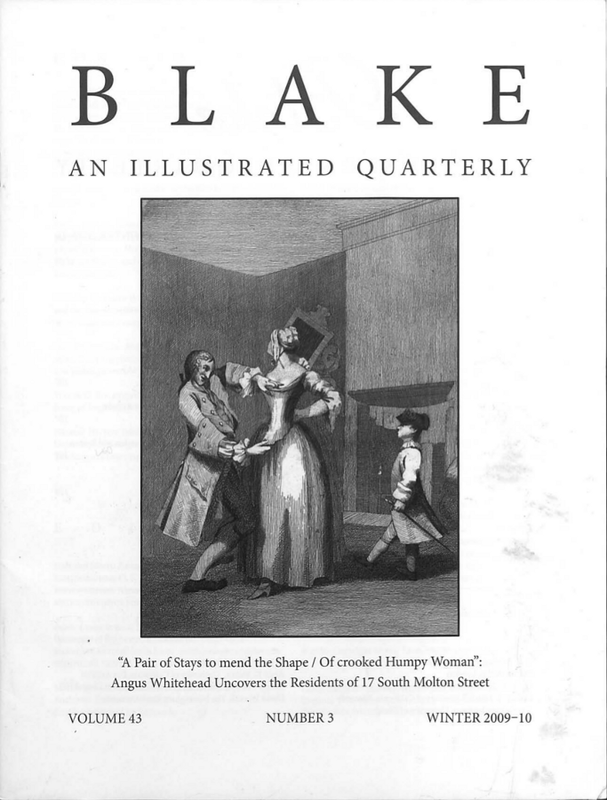 He is currently preparing a monograph exploring the later years (1803-31) of William and Catherine Blake. His essay on a recently discovered epigram by Robert Bloomfield is forthcoming in the Robert Bloomfield Society Newsletter. NANCY MOORE GOSLEE has just become Distinguished Humanities Professor Emerita, Department of English, University of Tennessee. Her recent publications include essays on Blake, on Shelley, and on the figure of William Wallace in romantic literature. MORTON D. PALEY is the author of Samuel Taylor Coleridge and the Fine Arts (2008). He is currently looking into the subject of Blake and George Romney. G. E. BENTLEY, JR., Blake’s checklister, is pursuing information about Blake’s apprentice Thomas Owen and Remember Me! and Blake’s patrons. WAYNE C. RIPLEY (wripley@winona.edu) is an assistant professor of English at Winona State University. NELSON HILTON (nhilton@uga.edu) teaches English at the University of Georgia, where he also directs its Center for Teaching and Learning. Cover: Detail of “The Stay-Maker,” Joseph Haynes after William Hogarth, 1782 (from Heath edition, 1822); image courtesy of Darvill’s Rare Prints, Durango, CO.